22 Feb, Glasgow – Two supporters of Fight Racism! Fight Imperialism! (Glasgow) were today violently arrested, Friday 22 February, shortly after 2pm outside the Royal Bank of Scotland on Gordon Street, Glasgow city centre. They were taking part in a peaceful rolling picket organised by Glasgow Against ATOS, a campaign committed to opposing the French multinational ATOS and the government’s attack on welfare. Both those arrested were taken to Stewart Street police station and were released at approximately 18:30. They are facing charges of liberating a prisoner from custody, resisting arrest and using a megaphone. Court date is set for Friday 22 March, for which solidarity protests are being organised. In an outrageous attack on democratic rights, their bail conditions include a ban on attending demonstrations in Glasgow city centre. This is the real reason behind these arrests: to disrupt and destroy political activity. Up to 50 Strathclyde police officers on foot, bike, police cars and vans, together with Community Safety CCTV vehicles, were mobilised in a planned operation against a demonstration of 20 people, under the direction of Inspector Muir at Stewart Street police station (A-division). The two supporters were arrested after aggressive provocation by police officers throughout the day. The immediate excuse for arrest was use of a megaphone. Hundreds of members of the public were left shocked as they witnessed officers violently attack peaceful protesters. Despite the police violence, Glasgow Against ATOS demonstrators continued the protest to the headquarters of the Commonwealth Games, followed by up to ten officers with another police van already in position at the offices on Albion Street. Today’s arrests were clearly planned. 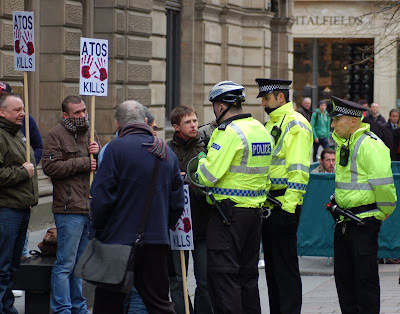 As Glasgow Against ATOS has grown in strength and influence over the past six months – building solidarity with the poor, the sick and disabled – police presence on the protests has also grown. The multinational companies, the banks, and their political allies, cannot allow the possibility of resistance developing to the government’s wholesale attack on welfare. With Glasgow due to host the Commonwealth Games in 2014, and ATOS as lead sponsor, any disruption to the corporate PR machine cannot be tolerated. Over the past three years, members of FRFI Glasgow have been repeatedly targeted by the police and Procurator Fiscal for their commitment to organising in defence of the working class and poor. These latest arrests will again be met head on with a successful political defence. Both FRFI Glasgow and Glasgow Against ATOS refuse to be criminalised for standing up for he rights of the poorest in society. This seemed like a peaceful protest so why were they arrested? They look like 2 nice lads-glad there are people such as these sticking up for disabled etc. I am 71yrts age, live in Huddersfield and cannot believe what the politicians have done to this country, well same world wide. I want a revolution! Thank you lads. Police Hands Off The Green Brigade!